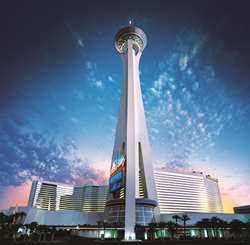 "Stratosphere Tower is synonymous with the excitement of Las Vegas,” said Stratosphere Casino, Hotel & Tower vice president & general manager Paul Hobson. “Our Tower is a popular culture icon that defines our city’s skyline." The iconic Stratosphere Tower, majestically reaching 1,149 feet above the famous Las Vegas Strip, will soon celebrate a big milestone – its 40 millionth visitor. To celebrate, the lucky 40 millionth visitor to Stratosphere Tower will win a big prize – a Stay & Play Getaway valued at more than $2,500. For more information regarding ticket prices or entry to the Tower please call 800.99.TOWER or visit http://www.StratosphereHotel.com.